As of January 2015 the contest record stands at an astounding 273.55 kg (603 lbs). This record was set by Matteo Circo in 2013, itself breaking a record set just a year earlier by his older brother. (As written in May 2000) A record that stood for two years, 159.7 kg, having been achieved by two teams with completely different designs, was obliterated in May 2000 when Matthew Sullivan, competing alone this time, refined the design he used to win in 1999 to become the first competitor to cross the 200 kg "barrier." Spectators erupted with loud applause as the last weights were cleared from the loading table. It was apparent that a new record was about to be set but no one in attendance expected to see a result that would overload the scale, capable of 399 lbs. When the final measurements, split across two readings were tabulated, Matthew's bridge was found to have held 209.4 kg (461 lbs)! This record may stand for some years. 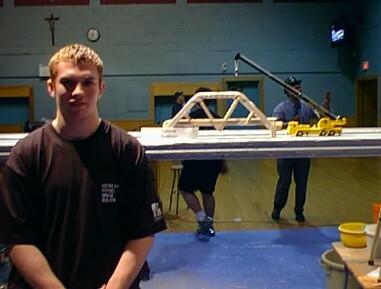 The 2000 contest was the most successful in the 20-year history of the contest, with 42 bridges entered. A number of teams scored in excess of 100 kg. 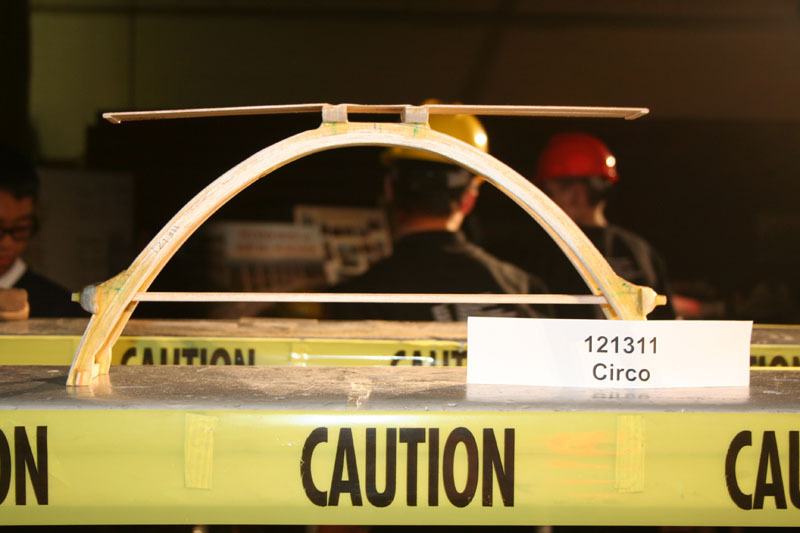 The team entry of Stefano Lovato and Marco Bordignon was peer-judged to be the bridge exhibiting the best workmanship and design. Check out our previous record holders while you are here.